Maybe it sounds a little dramatic claiming that I’ve eaten food cooked in the fires of hell, but that’s the selling point for the delicacies you can get in a place called Beppu, Oita, located in the southern island of Kyushu. 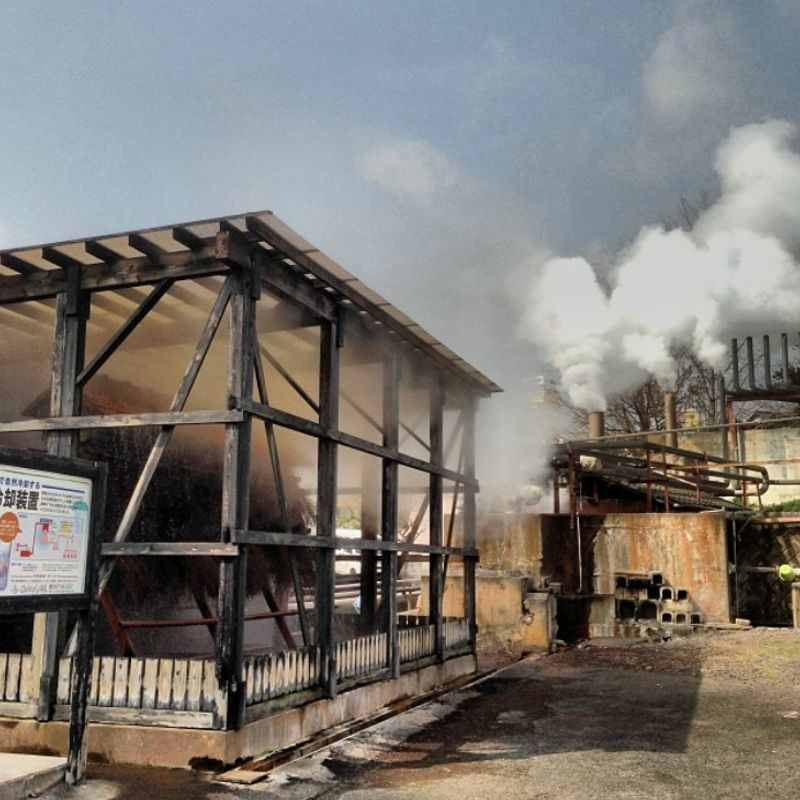 Beppu is one of Japan’s most famous onsen spots, in part because it happens to be situated where surface level geothermal energy is among the strongest in Japan. The same heat that warms the water for your onsen also causes steam to rise up through natural and man-made vents in the ground. This steam, the locals say, comes from the depths of hell--or jigoku in Japanese. While the steam adds a great deal to the town’s aesthetic (especially when enjoying the view of Beppu and the adjacent ocean from your hot tub), it also serves a practical function in cooking. Imagine if you had a ready-made steamer all set up just by having a vent in the ground with Mother Nature doing the rest of the work. Well, plenty of restaurants and shops in Beppu take advantage of that, so the regional eats here happen to focus on steamed food. What kind of steamed food you may ask? My personal favorite happens to be Beppu's nikuman, or steamed buns filled with meat. There's something about a nikuman that has been cooked by geothermal heat that makes it just a little tastier than its counterparts that come from a convenience store steamer. It didn't hurt that the shop owner was hand-making them fresh right in front of us either. Other options include steamed sweet potatoes. The local variety of sweet potato is called satsuma-imo, and they happen to be one of Kyushu's signature crops. These steamed potatoes certainly taste different than Japan's other popular sweet potato snack of yaki-imo, which are cooked on a bed of stones and have more of a roasted flavor. Instead, the steamed satsuma-imo that you get in Beppu is about the softest, creamiest cooked potato you’ll find in the world. The flavor is so sweet that it will make you think that the cooks added sugar to it, but no, the potato really is the only ingredient. Another thing I really like in Beppu are the steamed eggs. Chickens happen to be one of the representative livestock on Kyushu, so naturally eggs would be featured in regional delicacies. Unlike sulfur spring eggs found elsewhere in Japan, these steamed eggs cooked by geothermal heat don’t have the awful, awful smell that accompany the black eggs common to a place like Hakone. The Beppu steamed eggs make for a nice snack on their own, or a tasty topping on any of the other many food options Beppu has to offer. Finally, round out your steamed meal with some steamed purin, or custard pudding. True, pudding may not seem like a historically traditional Japanese food, but those who know the history of Kyushu understand that the port of Nagasaki happened to be the only one open to foreign traders for many, many years. As such, Kyushu happens to have a lot of western influences in some of their most cherished local dishes--especially their desserts. So don’t feel too guilty about eating steamed pudding or cake in Beppu, because it’s probably been around longer in Japan than your country or mine has existed! So if you like onsen and you don’t mind an extra flight or a fairly long bullet train ride, I highly recommend heading to Beppu. While you’re there, go ahead and indulge in some of that devil’s food--the steamed goodness cooked from the heat said to rise from the depths of hell.